Gold Is Now 3 Times Overpriced! Historical averages matter; sub-$500 gold is likely. Last November, with gold trading at $1,351 per ounce, I warned investors that gold could eventually drop below $500. With gold achieving new nominal highs, I challenged gold enthusiasts to refute my quantitative argument last week. One member of the CAPS community, Dave in Qatar (whereaminow), took up my challenge. Reflecting on some of the points he raised and updating my pricing model has solidified my conviction that gold is now overpriced by a factor of more than three. Gold enthusiasts -- including my challenger -- are always going on about the runaway growth in the money supply and they extrapolate wild price targets for gold on that basis. However, it makes more sense to focus on inflation, since that is what investors should be concerned with when they evaluate an asset as a store of value. In plain terms, nobody cares about the size of the money supply when they are spending accumulated savings. What they care about is whether their savings buys the same, fewer, or more goods and services than they used to. Why focus on a proximate cause (the money supply), when you have a measurable variable (inflation), which is exactly what you're after? 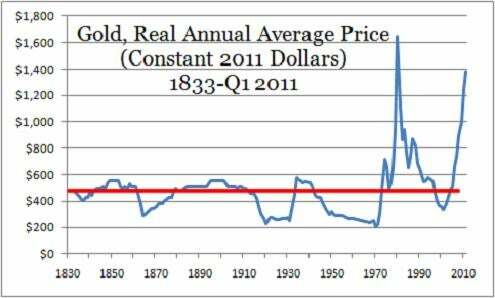 My updated $475 fair price estimate for gold is based on the long-term average of inflation-adjusted gold prices going back to 1833 (I use the same methodology here to show that silver is also a massive bubble.) My challenger wants to exclude any data prior to 1971, arguing that fixed-price regimes are irrelevant to this analysis, even declaring that "there is no historical mean price of gold." I entirely agree with that last statement -- if we are referring to nominal prices. However, the data suggests that inflation-adjusted prices do have an average that looks pretty stable (see graph below). This is consistent with a notion that is very dear to gold investors -- that of the yellow metal as a stable store of value. Source: Kitco, Handbook of Labor Statistics, U.S. Department of Labor, Bureau of Labor Statistics. Under classical and managed gold standards, the nominal price of gold was fixed, but that didn't prevent real gold prices from adjusting. Real gold prices varied with the supply of gold, the allocation between monetary and nonmonetary gold and the returns on real assets, including stocks and bonds. The fact that real gold prices were less volatile prior to 1971 is not reason enough to throw that period out. Changes in volatility regimes aren't incompatible with the existence of a stable average. Another objection that gold enthusiasts raise constantly is the notion that the consumer price index published by the Bureau of Labor Statistics no longer provides an accurate picture of inflation because of some technical changes in the calculation methodology. I don't think that gold enthusiasts' criticisms of the CPI withstand scrutiny; in fact, some of them are based on outright falsehoods. However, for the benefit of those who cherish that argument, I derived a second estimate by substituting an alternative CPI series for the post-1969 years. Shadow Government Statistics, the research firm that produces the series, claims it is free from the alleged distortions contained in official CPI figures. On that basis, the long-term average real price of gold in current dollars is $1,523, which suggests that gold is fairly priced at its current level. I want to emphasize that I consider that this estimate contains a significant upward bias and investors shouldn't rely on it as a benchmark for gold pricing. The only reason I am publishing it here is to show that even if we accept one of the gold enthusiasts' primary fallacies, there is no evidence that gold should command a premium to current prices. Investors are, of course, free to pay more than three times the fair price for gold ($475 per ounce) in the anticipation of hyperinflation, but they should recognize that they are making a high-risk bet. Let me be clear about what I am and am not saying. Gold is in a bubble, but I'm not predicting an imminent fall in its price. There is no way to time the bursting of a bubble; it could happen several months from now, just as it could take several years. My best guess is that gold prices will decline significantly by the end of 2012, with multiple interest rate hikes by the Fed as the catalyst. But that is nothing more than guesswork; the only thing I am reasonably confident of is that the price will eventually decline by roughly two-thirds (or more!). In that context, owners of gold bullion, the SPDR Gold Shares (NYSE: GLD), or other gold products should accept that they are living on borrowed time. Shareholders of gold miners including Yamana Gold (NYSE: AUY), Freeport-McMoRan Copper & Gold (NYSE: FCX), and Goldcorp (NYSE: GG) should review the assumptions regarding gold prices that are implicit in the miners' valuations. And neither group should seek safety in the iShares Silver Trust. For reliable protection of your purchasing power, I recommend high-quality dividend stocks instead, when they are purchased at reasonable valuations. Readers can take a look at Abbott Laboratories (NYSE: ABT) or Intel (Nasdaq: INTC), for example -- both stocks look like they meet those criteria now (to track these stocks by adding them to your watchlist, click here). With gold prices at historic highs, one little-known company is making a fortune. Find out which Tiny Gold Stock Is Digging Up Massive Profits.